As a person with very fair skin, I have always had trouble finding my perfect foundation. Always looking for perfection, I've rarely ever bought the same foundation twice. They always end up either looking bad in natural light, caking up half way through the day, oxidizing yellow, or flaking off. However, after many years of searching, I think I've found my Holy Grail of foundation. 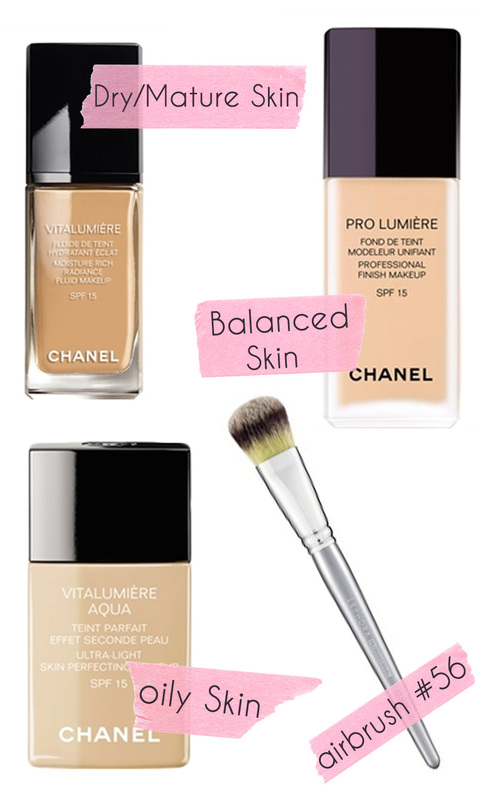 I decided to give Chanel foundations a try because so many other makeup artists have it in their kits. When I went to the Chanel makeup counter, the makeup artist gave me several formulas to try: VitaLumiere Aqua (a light water based fluid for light to medium coverage), VitaLumiere (a hydrating and light reflecting fluid for light to medium coverage), and ProLumiere (an oil free formula with light reflecting pigments that give medium to full coverage). After trying them all, I bought the ProLumiere. It comes in a glass bottle with a pump top that measures out the perfect amount of product for a single use. I applied the foundation with my favorite foundation brush the Sephora platinum airbrush #56 ($32). I was immediately in love with the texture and the fact that I needed very little concealer. At the end of a long day I checked how the foundation looked, and it still looked flawless even after I'd performed several facials with steam, been outside in the humidity, and stayed out late with the girls. The ProLumiere ($54) was my favorite, but oily skin types would benefit from the VitaLumiere Aqua ($45) and drier or mature skin types would do well with VitaLumiere ($55). I encourage everyone when shopping for makeup to ask for samples and try as many as possible. I'm curious to know how many of you have found your Holy Grail foundation? Layne is a licensed esthetician and makeup artist working at Urban Sanctuary in Athens, GA. She writes the bi-weekly column, Down and Out Beauty. Yes!.. It feel good when we find where we belong. Thank you for this post! I have been considering the VitaLumiere Aqua (I have very oily skin). This might have been the push I needed. I love reading these because I'm so interested in makeup and what people love best. I was dedicated to Dior's Airflash foundation (even though it's pricey at $60) until I jumped on the Bare Minerals train. Now I LOVE Bare Minerals so much--makes my skin look near flawless and is so light. Thanks for sharing! Great tips. I use Bare Minerals and really do like it (I hardly feel like I'm wearing anything when I have it on), but I wonder if it is the best at lasting through the day. I'm impressed with how long the ProLumiere lasted for you! Interesting! I have never found my perfect yet, so reviews are oh so helpful. Yep, it's worth the bucks. Bobbi Brown makes nice ones but they seem to fade a bit quicker. I have not found the perfect foundation yet myself. I too have not purchase the same foundation twice and I am now looking for a new foundation so this comes at a perfect time. I will have to try Chanel foundation next. I need the staying power. Hello, what about something a bit more environmentally friendly, like Vapour Organics? Their foundation goes on like silk, has an excellent dewy coverage--and is produced using recyclable packaging, non-toxic ingredients and wind power! A little pricey, but I love the feel of the Atmosphere Foundation on my face. As a mother of a 20 something daughter, i have to tell you, she swears by her chanel foundation and powder. I have yet to try it, but now think I will.